To most, the colors of their favorite sports team runs through their blood—and perhaps in their decor too! Sports enthusiasm goes a long way for all of its fans; just walk into your favorite local baby boutique, and the “littlest sports fan” section is NOT so little! When my son was ready for his big boy room, I made the mistake of asking what kind of room he wanted. My choices were sports or batman. I went with sports (thinking the batman obsession could be short lived), and instead of making the entire room sports obsessed, I brought it in with color, vintage wall decor and a few simple accessories. To my then three-year-old, it was the perfect sports big boy room. Score. I love how this mom’s all-star birthday party focused more on the theme of sports and less on a particular team. The cookies and cake pops are almost too cute to eat, and the orange and green color scheme is very team neutral! The designer of A Room with a View added in the parents’ love of sports by using the colors of their favorite teams as accent colors. This is a nice, subtle way to incorporate sports into your child’s nursery. Hudson’s Vintage University Nursery is a throwback to his parents’ alma mater. The dark furniture creates a bold contrast against the creamy walls, and I love how the little owls symbolize the dad’s fraternity and I’m sure many fun memories! There are so many ways to bring in your favorite sports and team colors—get creative and most importantly, make it your own! Your little star will love it. Hudson’s Vintage University Nursery is just perfect! I love the warm colors and the parents’ homage to their alma mater. A bit confused… When you said you made a mistake by asking your boy what theme he wanted, did you mean that he told you he wanted the batman theme but that you gave him the sporty one instead? I agree! The room is so well thought of and every detail just fits right in there. 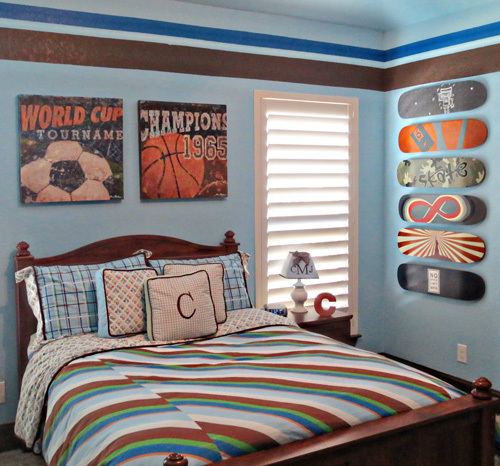 I think a sporty room will always be perfect for boys. They are such active and bouncy creatures, and balls and other sporty stuff will always be appropriate and fitting. Yes, Kimmy, I agree. I like this room very much too. I would love to pay tribute to my university, too, but I sorta don’t like the university color.